Batty the battered bat faces spending Halloween at a rescue sanctuary after enduring a fright night of his own. 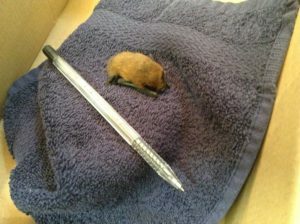 The tiny Pipistrelle Bat, which is just 40mm long and weighs only six grams, was brought to our hospital after a night time attack by a cat. Our staff had the tricky task of examining the tiny bat, who they quickly nick-named Batty. Kim Rogers, our Client Care Manager, said: “A member of the public brought ‘Batty’ into us after he’d been pounced on by a cat. “The cat was then caught in the act by its owners after it had carried the bat into house through the cat flap. For more information about our hopsital, which has been serving the community at its London Road base for more than 50 years call 01344 450345 or search for ‘Moor Cottage Veterinary Hospital’ on Facebook.